IMPORTANT! DATE CHANGE for the upcoming “Right Information…The Right Time” from November 13, 2017 to Monday, November 20, 2017. Same time – 7:00 pm-9:00 pm, Powers Hall. I personally want you to know that the House of Representatives has been called into formal session to deliberate and vote on the Criminal Justice Reform bills this Monday, November 13, likely into the evening hours. In my seven years as your elected Representative, outside of budget week, I have never been called into session on a Monday! What are the chances! I am responsible and accountable to the 40,000 people of the 13th Norfolk District; Needham, Dover and Precinct 1 and 2 in Medfield for many actions but my greatest responsibility as a Legislator is to deliberate and vote. I hope that you will make every effort to join me for our program as planned on the following Monday, November 20, 7 pm-9-pm, Powers Hall. 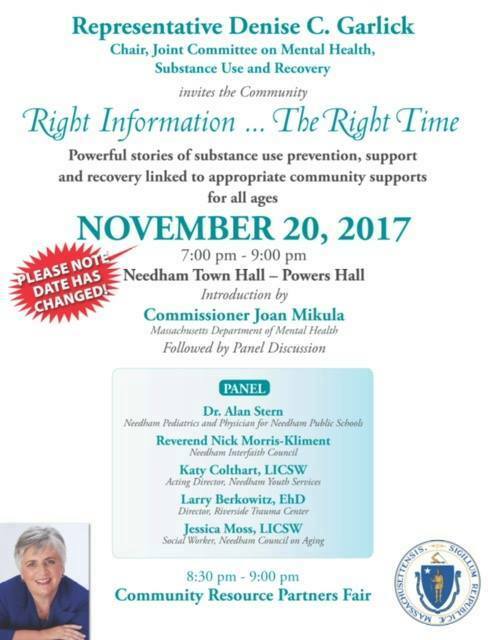 I am looking forward to an evening filled with information, resources and thoughtful discussion with our panel of experts and community resource partners. Thanks for your understanding of this necessary scheduling change.